More than 300 Single Parents on weekend, received free medical treatment during the unveiling of a non-governmental organisation called, Poverty Aid Uplifting Lives (PAUL). 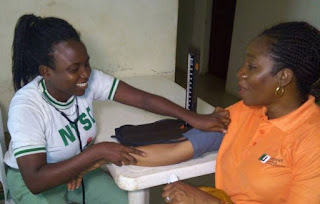 The event tagged, ‘Journey of Single Parents across the Nation,’ held at the Nigerian Institute of Medical Research (NIMR) Lagos, women who gathered from all parts of the busy commercial city got medical attention ranging from free malaria and hypertension tests to treatment as well as weight check. Apart from the free medical treatment, 50 single parents were selected for free economic empowerment. Similarly, 100 people qualified for a raffle draw which attracted different prizes. Another 20 people went home with 50kg bag rice respectively, while each participant went home with souvenirs and free foodstuffs. Addressing journalists on the focus on single parents, the National Coordinator of PAUL, Unoma Ebun said a lot of NGOs have done one thing or the other on women or children, but none has ever targeted single parents. “I am a single mother, so I really know how it is. Though I had a fantastic support system; my family, my child father, friends were all by my side, yet I didn’t find it easy. So when the international body said they wanted to start a foundation and wanted me to be part of it, I therefore suggested that we should target single parents, especially single mothers,” she explained. According to Ebun, PAUL foundation is committed to implementing social and economic empowerment to see a society where the disadvantaged persons have equal opportunity to fulfill their economic potential. Also speaking to journalists, Paul Nesbitt, the President of the foundation said the focus is to alleviate poverty in the society, especially among single mothers and unemployed. “I noticed that the pains on the faces of people. In Ireland where I come from, the government looks after pregnant women, they provide money weekly to support the mother and her child. But, that doesn’t happen in Nigeria so that’s why I found the NGO in Nigeria. One of the trustee members, Femi Adetunji, a lawyer, Justicequest Partners, also said the programme is basically about creating a balance; a level playing field for all the people who are bereaved who lost their husbands, people whose wives absconded, or people who got pregnant at young age and had to go through the burden of parenting their children alone. “This is all about single parenting; balancing the odds, ensuring that we give them a level playing field, an opportunity for them to succeed with their children. As a lawyer, we provide the legal backings to ensure that they work within the confines of law.